Charles T. "Chuck" Moorefield, Jr.
Plant a tree in memory of Charles T.
9 trees planted in memory of Charles T. "Chuck" Moorefield, Jr. Celebrating the life of Charles T. "Chuck" Moorefield, Jr.
Be the first to share your favorite memory, photo or story of Charles T.. This memorial page is dedicated for family, friends and future generations to celebrate the life of their loved one. 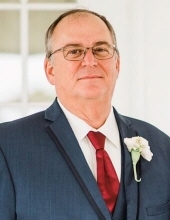 Obituary for Charles T. "Chuck" Moorefield, Jr.
Charles T. “Chuck” Moorefield, Jr., 58, of Smyrna, TN and formerly of Hopkinsville, KY died Monday, March 18, 2019 at his residence. Memorial services will be 2:00 p.m. Saturday, March 23, 2019 at Hughart, Beard & Giles Funeral Home with the Rev. Buddy Weatherford officiating. Visitation will be Saturday from 1:00 p.m. until the service hour at the funeral home. Hughart, Beard & Giles Funeral Home is in charge of the arrangements. A native of Hopkinsville, KY he was born June 28, 1960 the son of Charles T. “Charlie” Moorefield, Sr. and Brenda Roper Moorefield of Hopkinsville, KY. He was an auto technician for Scott Oldsmobile Nissan for many years before becoming an instructor for Lincoln Tech-Nashville Auto Diesel College in Nashville, TN. He then went to work for Nissan North America first as a Tech Line Advisor and advancing through the ranks to Senior Planner, Sales Product Curriculum, and Service Technical Training Department. He enjoyed his work and his leisure time to include camping and fishing. Survivors in addition to his parents include his wife: Elaine Moorefield; his son: Benjamin Moorefield of Jackson, TN; his stepsons: Joe (Kayla) Hudnall of Elkton, KY and Dustin (Carla) Hudnall of Kalispell, MT; his brother: Jeff (Sally) Moorefield of Georgetown, IN; his sister: Michelle (Mike) Voss of Decatur, AL; several step grandchildren, nieces, and nephews. Memorial contributions are suggested to Alive Hospice 1718 Patterson Street, Nashville, TN 37203. To plant a tree in memory of Charles T. "Chuck" Moorefield, Jr., please visit our Tribute Store. "Email Address" would like to share the life celebration of Charles T. "Chuck" Moorefield, Jr.. Click on the "link" to go to share a favorite memory or leave a condolence message for the family.